In my previous article I set the rough background for where the learner market is currently at in relation to automatic/manual. Now I’d like to expand into the details regarding pupils in automatic/electric cars and if there are any significant issues. As the non-sensical stigma against auto finally dies away the demand for automatic continues to increase rapidly. The modern generation are attracted to the technology that makes up the new incarnation of cars. My children will turn 17 in a few years and will never drive a manual, most likely they will never drive a fossil fuel car. Admittedly they might have been a bit influenced by their parents! They have no desire for manual and some of their friends talk the same way. The outdated chants of “manual is proper driving” are empty words which seem to imply you have to make something difficult simply for the sake of making it difficult or maybe just because that’s how it’s traditionally always been done. The purpose of technology is to make our tools more accessible and to move on from the redundant machinery of a bygone era. I trekked out on a Pass Plus recently with one of my pupils in her perfectly nice petrol car but she stated it might be the only fossil fuel car she owns because the next step will be EV. By teaching in an electric car you give them a taste of the future and anything else will pale in comparison, unless you’ve spent time in a modern EV you simply won’t get this. An EV will function just like any automatic allowing transferable skills to petrol/diesel autos. I teach variations in the same way I teach the differences between any cars. For example some cars have hand brakes and others have electronic or foot operated parking brakes. These discrepancies exist across all cars, I remember struggling to find the lights in a Vauxhall after spending years in Toyotas. So the only true difference is sensation because the smooth grace of an EV contrasts against the roughness, vibration and noise of an ICE (internal combustion engine). When my EV was off the road for a week due to a rear end shunt I was loaned an ICE car and it was captivating investigating the differences in sensation and how my pupils perceived this. The physical skills are the same but you notice the lag and weakness of an ICE when you are accustomed to a more responsive vehicle, this lag is caused by having to convert fuel to power and the constant breaks in acceleration are induced by the car changing gear whereas in an EV the response is instantaneous and continuous. Being fair one pupil highlighted that due to his dyspraxia the increased sensations of an ICE car could have it’s benefits for him. Even the most basic EV will be very agile so I keep mine in ECO mode to better simulate a traditional automatic, but if a pupil is curious I will help them with exploring the different modes available in a modern auto. At relevant points in my driving course I’ll discuss the tech limitations of an EV against an ICE. Before starting my 100 mile motorway lesson we do journey planning which includes checking the fuel tank/range. 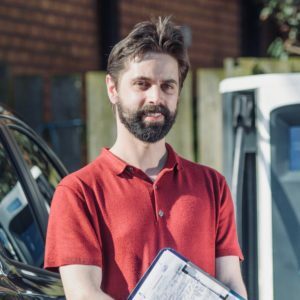 My 30kWh Leaf has an average range of 120-140 miles, when looking at my pre-prepared map we check out service stations we could use to take a break. There are plenty but I’ve selected a service station about mid-way into the journey where we have a rest, the pupil plugs the car in, we grab a coffee and look at photos on my tablet of motorway features we’ve experienced to prompt questions and debate. By the time we’re done the car is back up to 100%, not that we needed it but like any car I don’t like running low on fuel. Now the new EV’s are beginning to match petrol engines for range this short term tech limitation is about to become irrelevant, so called range anxiety is on it’s way out (hurrah). A common misconception is to believe that some EV’s only have 1 pedal due to Nissan’s marketing of their ePedal. The ePedal allows you to drive using just the accelerator with braking and stopping linked into how the accelerator is released – this does not shut down the brake pedal. By default the car will drive like a standard auto because ePedal has to be switched on. New cars come with a lot of technology and it is our job as teachers to move with the times and accept this. While we have the opportunity it is important to support the pupil and help them safely understand and master mature use of these new and often rather fantastic inventions rather than pretending we’re still in the 1990’s. What on earth is the point of inventing a reversing camera and then telling someone they can’t use it‽ (If you’re wondering what that symbol is google ‘interrobang’). Even an entry model new Leaf will come with ePedal and adaptive cruise control. It’s important to teach to a level where the skills are transferable between all cars but at the same time there’s little point having access to all this modern tech and then not helping people use it. I teach safe use of cruise control near the end of my driving course during our 3 hour motorway lesson. I teach to use yet not rely on the devices a car is supplied with. The DVSA take the same approach, they want to see safe demonstration of modern technology integrated into the drive with reversing cameras being the obvious example. We already have confirmation they are happy to see safe use of ePedal in a driving test, it’s quite fun driving a car with just 1 pedal and very intuitive. It’s a personal preference thing because I use it a lot but my wife isn’t so keen on it. With cars now featuring low level driver assist features it makes sense for us to teach safe use of this technology, the Leaf uses it’s Pro Pilot to take over basic steering and pedals but this is NOT autonomous driving – it is a feature to be carefully monitored. These features will not be going away so it is our job to teach mature use while we have the opportunity because at some point in the future these pupils will be in such cars. My wife uses driver assist features often but she monitors it attentively, we went to Luton Airport and back and she rarely touched the pedals. This tech is defined as Level 1 Autonomy which is very low level, a true autonomous car is Level 4-5 and we will be seeing these on the roads by 2025. Of course passing in any automatic car (EV, hybrid, hydrogen, traditional) will result in an automatic only driving licence. Whereas once upon a time this would have been a serious restriction it is no longer the problem it once was and with every year that passes it becomes less of an issue. As per my last article we are only a couple of years away from there being more automatics in production than manual cars and this is constantly feeding down into the 2nd hand market. Businesses and fleets across the country are progressively converting over to automatic and manual is in significant decline. Nearly every car manufacturer has committed to finishing with manual cars by 2030 with Volvo, Jaguar and Land Rover committed by 2020. To believe that you NEED a manual licence in this new era is increasingly becoming outdated, good luck finding a new manual car after 2030. Of course if a pupil enjoys manual then it is the right choice for them and they should pursue that. But if an individual struggles and doesn’t enjoy driving instead of trapping themselves to coping in a manual it would be better to thrive in an automatic. If a pupil chooses to learn automatic they should not be pushed reluctantly away from their choice, especially based on outdated concepts. There is an obvious problem, this boom in demand for automatic has resulted in a lot of pupils seeking to buy 2nd hand autos only to find they are all competing over the few available on the market due to auto traditionally being a minority. More cars are being pumped into the top end of the market all the time but it takes a while for this to filter down into the cheaper market so it’s going to be a bit rough for a few years as pupils on a lower budget try to hunt down the affordable ones. A new driver strapped for cash can pick up a petrol car for under £1000 but this comes with many ‘hidden’ costs in terms of repairs, increased insurance due to potentially lower NCAP ratings, tax and fuel bills. An EV will cost much more up front (currently) but the behind the scenes costs are dramatically lower. 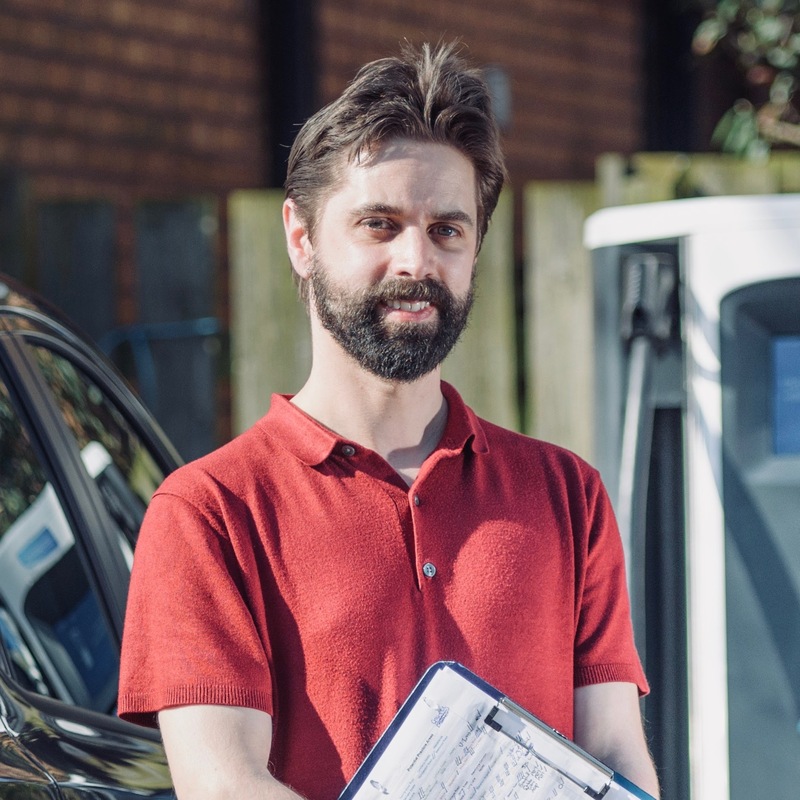 If you spend £50 a week on petrol within 5 years you would have saved over £9,000, that’s the current second hand purchase price of a 2015 Nissan Leaf or Renault Zoe. An EV might not be a pupils 1st car but it is quite possibly going to be their 2nd or 3rd.